Quality and lightly tride filly Ruby Armani (pictured) has her sights set on a lucrative Spring and Summer four-year-old campaign after competing with some of the country’s top three-year-old’s of last season. 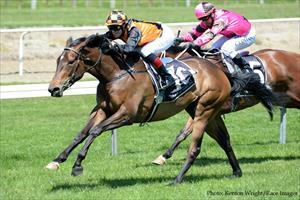 Having only made five race day appearances, Ruby Armani kicked off in spectacular fashion when breaking her maiden at her first start over 1200m at Tauranga in the hands of Alysha Collett. Traveling wide with little cover throughout, the daughter of Makfi was able to accelerate at the top of the straight and leave her rivals for dead over the concluding stages to win by a comfortable 1 ½ lengths. Running an unlucky third placing behind eventual stakes winner Summer’s Day at her next outing, Ruby Armani then produced a gallant effort in the Listed Trevor Eagle Memorial Stakes to run fifth behind class filly Alamer, Group 1 winners Dukedom and Valley Girl, stakes placed Sultan of Swing, and defeating NZ Derby runner-up What’s The Story, Group 2 winner Coldplay and stakes winner Thunder Down Under. Ruby Armani went on further to contest another two quality races where she found herself running up close in behind horses such as Ruud Not Too, Get That Give, Strada Cavallo, Capella, Preetha Varma and Volks Lightning. While plans have yet to be confirmed by training partnership Mike Moroney and Pam Gerard, Ruby Armani will look to have one or two jump outs over the coming weeks prior to making her first public appearance as a four-year-old. “She’s come to hand well and we’re looking forward to what will hopefully be a successful campaign,” co-trainer Pam Gerard said. Ruby Armani is from the unraced St Ballado mare Trujillo – making her a half-sister to the former Ballymore Stables trained Our Tigress (also the dam of Starstripe).